The Mauryan period in the history of the Indian subcontinent lasted between 323 B.C to about 125 B.C. It started when king Mahapadma of the Nandas was overpowered by Chandragupra Maurya in Magadha. He was guided by Chanakya whose teachings are revered even today. The Mauryan rule achieved great unity in ancient India, not just culturally but also politically. His grandson was King Ashoka who erected pillars at many places. The art of this time is evident from pillars, stupas and caves. 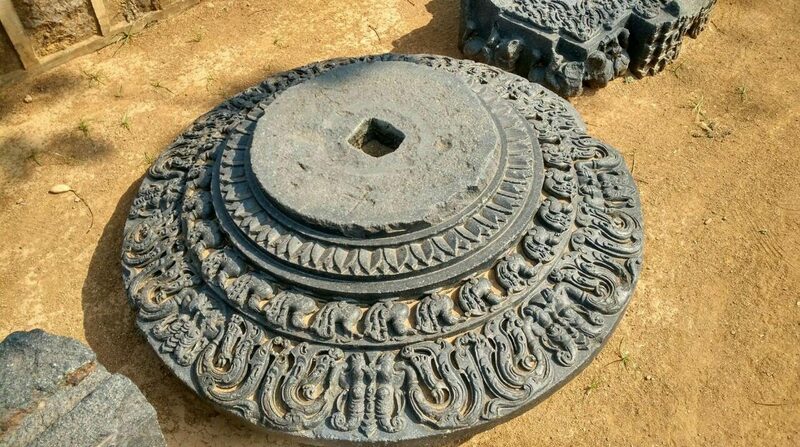 Some remains of the capital city of Pataliputra are available which throw light on the styles prevalent. Greek influence is found on the style of art and architecture. The stupas at Sanchi,Sarnath and Amaravati were built as brick and masonry mounds during the reign of Ashoka. Pillars erected by him are found in Afghanistan,Nepal border,Odisha and Karnataka. The pillars were carved in two types of stone, red and white sandstone from Mathura; buff coloured, fine grained,sandstone with small black spots, from Chunar near Varanasi. The religious pillars were erected across the Gangetic plain, inscribed with Ashokan edicts. The capital part of the pillar had an animal; the lion capital of Sarnath, bull capital of Rampurva in Bihar, lion capital of Lauria-Nandangrah,also at Bihar. Ashoka pillar,Vaishali, 3rd century, Bihar. Pottery is associated with the Mauryan times; Northern Black Polished Ware is typical of early Mauryan era. It was made of alluvial clay either greyish or red. It was given burnished dressing , a jet black or deep grey glaze. This was used for dishes and bowls. The Pataliputra capital shows Greek and Acheamenid influence. It is dated to 3rd century B.C. it has volute, bead, reel and honeysuckle motifs. The capital city had a large timber palisade around it. it had 64 gates and 570 towers as per Megasthenes. The towers were made of sandstone similar to Ashokan pillars. Mauryan architecture can still be seen at the Barabar mounts, grottoes of Lomas Rishi. Statuettes of the Maurya period, 4th-3rd century B.C, Musée Guimet,Paris. Bull capital Rampurva, Indian Museum, Kolkata. Female figure, teracotta,Maurya period, North India. This entry was posted in Ancient Indian history, art history, art history of India, Ashoka, asian art, Mauryan dynasty and tagged Ancient Indian history, art history, Ashoka, Mauryan dynasty, sculpture on April 26, 2017 by historyreads.